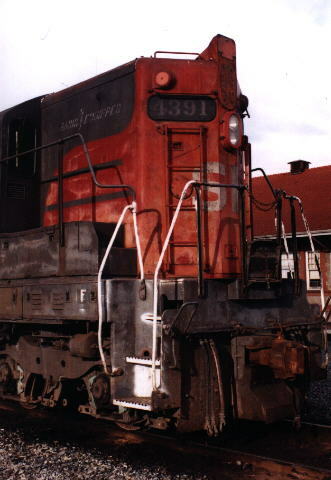 Built in 1956 to work the branch lines in Oregon, SP SD-9E number 4391 sits in front of the depot in Medford, Oregon in February, 1995. No stranger to the Siskiyou Line, the 4391 is now on foreign rails as she helps out with yard work until more Railtex engines arrive. Typical CORP hauler power for February, 1995. A few freshly painted red and gray CORP GP-38's, some ex-BN GP-40's from other Railtex lines such as Dallas, Garland and Northeastern and Texas and Northeastern, and even a GP-39-2 borrowed from the Willamette & Pacific and still in Santa Fe paint. Leased power like this ex-Conrail GP-38 from Helm Leasing filled in on hauler power for several months. You can still make out part of the "mating worms" logo of the long gone Penn Central in the glare off the long hood. 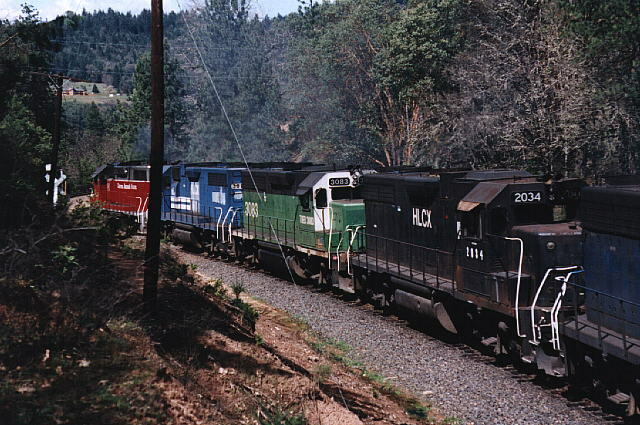 Central Oregon & Pacific GP-38 in the paint scheme they share with sister Railtex line, the Missouri and Northern Arkansas. 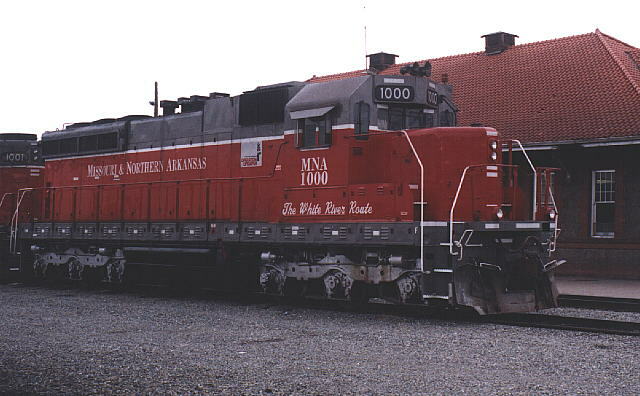 A real surprise back in February, 1995 was a pair of Missouri and Northern Arkansas SD-20's. These locomotives started out as SD-24's and were rebuilt by the Illinois Central. 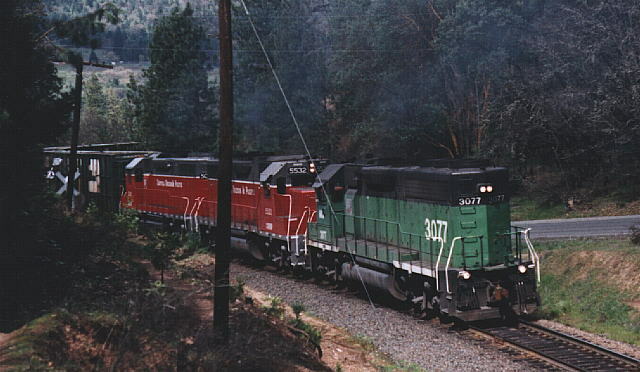 CORP typically disdained six axle power on the southern end of the railroad due to its tendancy to spread rails and the fact that the Southern Pacific had done minimal maintainence on the line for several years prior to conveying it to CORP. Furthemore, the SD-20's lacked the dynamic brakes so necessary for mountain railroading. After a few visits to Medford, they worked as switchers in and around Roseburg and were gone from the property by the end of the year. Cresting the top of Merlin Grade near Hugo, this Medford -- Glendale Hauler displays quite a diversity of railroading heritage and paint schemes on this April, 1995 morning. 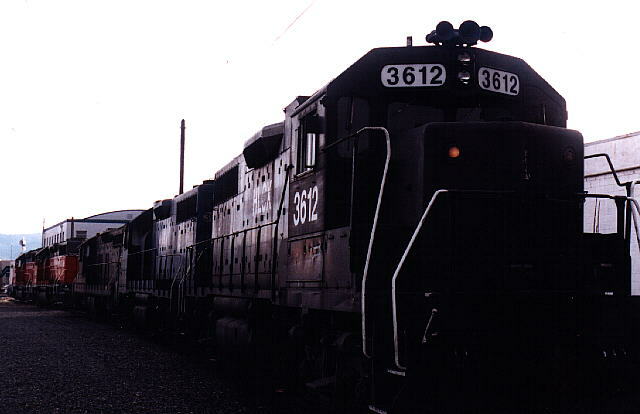 All units are Gp-38's except for the single ex-BN GP-40. Until they reopened the south end out of Medford, CORP had to run all freight north to Eugene. During the week they didn't have enough power to handle all the cars and by Saturday, there would be quite a train that needed to run north. Since the local jobs weren't working, the local power was assembled as helpers. These three units are pushing the same train as shown above.